January 8, 2013 — For centuries, people thought the world was flat until Aristotle conclusively proved that it was round. In geology circles, researchers have long contended that small mountain rivers create a major share of the sediment that is eventually deposited into the world’s oceans. 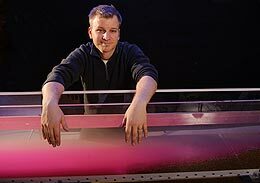 Brandon McElroy, assistant professor in the University of Wyoming Department of Geology and Geophysics, is a member of a research group that has challenged those findings and proffered that the majority of sediment delivered to the oceans actually comes directly from sediment located in floodplains and other low-lying areas. Their work, in a paper titled “Earth is (Mostly) Flat: Apportionment of the Flux of Continental Sediment Over Millennial Time Scales” was published online Jan. 4 in Geology, one of the flagship journals of the Geological Society of America. The print version of the paper will appear in Geology during March. The group compiled data from erosion rate studies of 990 river basins. These included some of the world’s largest, including the Amazon and the Ganges, as well as smaller river basins that drain Utah’s Wasatch Mountains and the Great Smoky Mountains in North Carolina, McElroy says. From that information, the group created a dataset they say contends that an abundance of lowland areas, including flood plains, creates far more sediment than even the steepest and most erosion-prone mountain slopes. While mountain slopes have a higher rate of carbon absorption compared to gently sloping land and flood plains, the latter far exceeds the former in terms of the world’s land surface, McElroy says. “If there is more mass loss, including chemical weathering (when rocks turn to soil) in lowland areas rather than mountains, then the potential carbon sink of lowland areas is large and should be investigated,” McElroy says. A carbon sink is a natural or artificial reservoir that accumulates and stores some carbon-containing chemicals for an indefinite period. McElroy collaborated with Jane Willenbring, a University of Pennsylvania associate professor of earth and environmental science; and Alexandru Codilean, a geoscientist at the GFZ German Research Center for Geosciences in Potsdam, Germany. McElroy previously collaborated with Willenbring on research projects as part of the National Center for Earth-Surface Dynamics, which is a National Science Foundation Science and Technology Center. The technique used in the compiled studies of erosion is based on the production of cosmogenic nuclides in sediment. Their study, funded by NSF and the GFZ Research Center, challenges previous studies that suggest small mountain rivers contributed most of the sediment. “I have thought, for a long time, that lowlands were a poorly understood contributor to the global sediment budget,” says McElroy. He suggests other geologists should study low-lying areas to better understand the carbon cycle and the effect on climate. To read the paper, go to http://geology.gsapubs.org/content/early/2013/01/04/G33918.1.abstract. Brandon McElroy, assistant professor in the University of Wyoming Department of Geology and Geophysics, contributed to a paper about sediment research that was published online this month in Geology. Hear UW researcher Brandon McElroy discuss published findings that challenge long-held beliefs about the source of sediment delivered to the oceans.